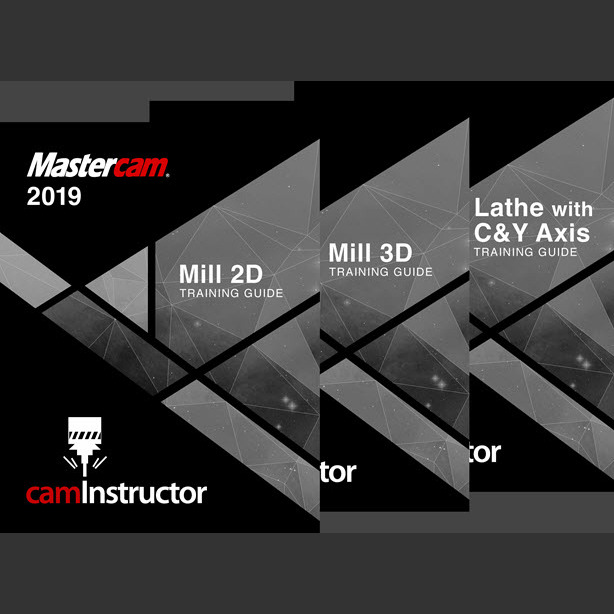 This Instructional Training Guide* provides all the instructions you need to learn Mastercam Mill 2D&3D and Lathe. Excellent for classes that offer both Mill and Lathe and want all the resources in one handy package. 8 lessons on how to use Mastercam to create 2.5D Mechanical CAD drawings and 2.5D Toolpaths for milling parts on a Vertical CNC Milling Machine. Using Mastercams new Dynamic & High Speed Toolpaths. 2 lessons on Feature Based Machining. 7 lessons on how to use Mastercam to create Mechanical CAD drawings and Toolpaths for turning parts on a CNC Lathe. Importing Solid Models from SolidWorks, Inventor and Creo and use Mastercam's solid chaining features. 3 lessons on how to use Mastercam to create C-Axis toolpaths. 2 Exercise drawings for each lesson plus 3 Advanced Exercise Drawings. Instructions for generating G-Code for each lesson. All lessons are designed so when they are completed the finished part can be machined. An optional Teacher Resource is available when purchasing a class set of textbooks/ online versions. Please email sales@caminstructor.com for more details.